This week’s buzz features a French atheist becoming a Christian scholar and an evolutionary biologist giving his students “The Talk”—about God and evolution. My animal behavior class, with 200 undergraduates, is built on a scaffolding of evolutionary biology. 1. Stephen Jay Gould’s understanding of science and religion as “nonoverlapping magisteria” is wrong. 3. Human beings don’t possess any supernatural traits that other animals lack. 4. Darwin makes the problem of suffering and evil worse, since pain and death are built into evolution. This article is worth reading, but I wish he’d just tell his students to watch Conor Cunningham’s documentary: Did Darwin Kill God? Seriously, set aside an hour to watch this documentary. It will defuse the “God vs. evolution” false dilemma for you. You have to read this short, fascinating account of how a French atheist—who was an engineer and a volleyball player—became a Christian scholar. I got the address of an evangelical church in Paris. I really went there as you would go to the zoo, in order to see some weird, exotic animals. I don’t remember a thing that the preacher said, but I was very, very uncomfortable. I hated God and religion, but God called me and loved me when I was a sinner. He saved me by grace alone, through faith alone, to his glory. His story is worth reading. Do you identify with any part of it? My friend Vlad Chituc wrote an excellent article for The Daily Beast last week. He’s one of my favorite atheist writers. The new ‘Openly Secular’ campaign illuminates prejudice against atheists. Will it convince Americans that nonbelievers can be trustworthy, moral, and even electable? You can always count on Vlad for a bright and thoughtful take on these issues. He’s the editor of NonProphet Status, a great Patheos blog. 2. As David Bentley Hart argues in his latest book, many atheists misunderstand and misuse the term “God.” (To be fair, poor Christian theology produces this misunderstanding!) This point about the word “God” reminds me of a classic scene from The Princess Bride. I came for the theology… I stayed for the Princess Bride. In all seriousness, I think “Did Darwin Kill God?” is an excellent resource. I wish it was shorter so I could convince my friends to watch it. Ha, I’m glad you enjoyed the video clip. 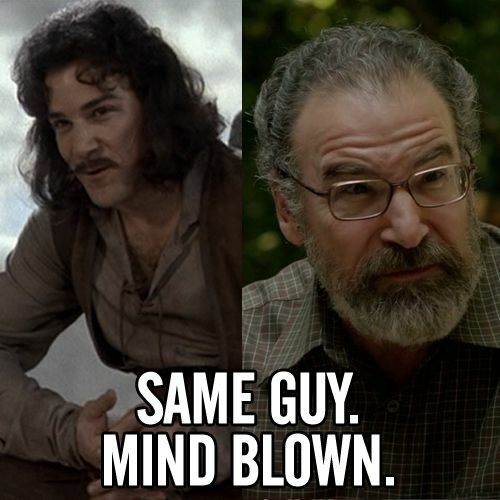 Fun fact: the guy who played Inigo Montoya plays Saul in “Homeland”! !